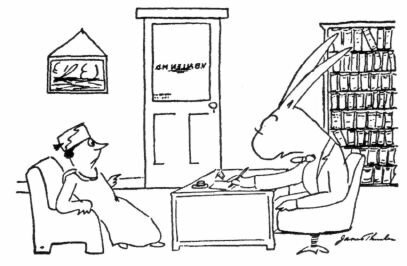 Figure 5.1 One of James Thurber’s well-known cartoons that appeared in The New Yorker. Could his visual hallucinations have been a source of inspiration for some of these cartoons? By James Thurber, 1937, from The New Yorker Collection. All rights reserved. Years ago you told me about a nun of the middle centuries who confused her retinal disturbances with holy visitation, although she saw only about one tenth of the holy symbols I see. Mine have included a blue Hoover, golden sparks, melting purple blobs, a skein of spit, a dancing brown spot, snowflakes, saffron and light blue waves, and two eight balls, to say nothing of the corona, which used to halo street lamps and is now brilliantly discernible when a shaft of light breaks against a crystal bowl or a bright metal edge. This corona, usually triple, is like a chrysanthemum composed of thousands of radiating petals, each ten times as slender and each containing in order the colors of the prism. Man has devised no spectacle of light in any way similar to this sublime arrangement of colors or holy visitation. Thurber knew how to use his visions creatively. “The daydreamer”, he said, “must visualize the dream so vividly and insistently that it becomes, in effect, an actuality”. Upon seeing his whimsical cartoons and reading his prose, I realized that Thurber probably suffered from an extraordinary neurological condition called Charles Bonnet syndrome. Patients with this curious disorder usually have damage somewhere in their visual pathway — in the eye or in the brain — causing them to be either completely or partially blind. Yet paradoxically, like Thurber, they start experiencing the most vivid visual hallucinations as if to “replace” the reality that is missing from their lives. Unlike many other disorders you will encounter in this book, Charles Bonnet syndrome is extremely common worldwide and affects millions of people whose vision has become compromised by glaucoma, cataracts, macular degeneration or diabetic retinopathy. Many such patients develop Thurberesque hallucinations — yet oddly enough most physicians have never heard about the disorder.2 One reason may be simply that people who have these symptoms are reluctant to mention them to anyone for fear of being labeled crazy. Who would believe that a blind person was seeing clowns and circus animals cavorting in her bedroom? When Grandma, sitting in her wheelchair in the nursing home, says, “What are all those water lilies doing on the floor?” her family is likely to think she’s lost her mind. If my diagnosis of Thurber’s condition is correct, we must conclude that he wasn’t just being metaphorical when he spoke of enhancing his creativity with his dreams and hallucinations; he really did experience all those haunting visions — a cat in a striped barrel did indeed cross his visual field, snowflakes danced and a lady walked through the side of the truck. But the images that Thurber and other Charles Bonnet patients experience are very different from those that you or I could conjure up in our minds. If I asked you to describe the American flag or to tell me how many sides a cube has, you’d maybe shut your eyes to avoid distraction and conjure up a faint internal mental picture, which you’d then proceed to scan and describe. (People vary greatly in this ability; many undergraduates say that they can only visualize four sides on a cube.) But the Charles Bonnet hallucinations are much more vivid and the patient has no conscious control over them — they emerge completely unbidden, although like real objects they may disappear when the eyes are closed. I was intrigued by these hallucinations because of the internal contradiction they represent. They seem so extraordinarily real to the patient — indeed some tell me that the images are more “real than reality” or that the colors are “supervivid” — and yet we know they are mere figments of the imagination. The study of this syndrome may thus allow us to explore that mysterious no-man’s-land between seeing and knowing and to discover how the lamp of our imagination illuminates the prosaic images of the world. Or it may even help us investigate the more basic question of how and where in the brain we actually “see” things — how the complex cascade of events in the thirty-odd visual areas in my cortex enables me to perceive and comprehend the world. What is visual imagination? Are the same parts of your brain active when you imagine an object — say, a cat — as when you look at it actually sitting in front of you? A decade ago, these might have been considered philosophical questions, but recently cognitive scientists have begun to probe these processes at the level of the brain itself and have come up with some surprising answers. It turns out that the human visual system has an astonishing ability to make educated guesses based on the fragmentary and evanescent images dancing in the eyeballs. Indeed, in the last chapter, I showed you many examples to illustrate that vision involves a great deal more than simply transmitting an image to a screen in the brain and that it is an active, constructive process. A specific manifestation of this is the brain’s remarkable capacity for dealing with inexplicable gaps in the visual image — a process that is sometimes loosely referred to as “filling in”. A rabbit viewed behind a picket fence, for instance, is not seen as a series of rabbit slices but as a single rabbit standing behind the vertical bars of the fence; your mind apparently fills in the missing rabbit segments. Even a glimpse of your cat’s tail sticking out from underneath the sofa evokes the image of the whole cat; you certainly don’t see a disembodied tail, gasp and panic or, like Lewis Carroll’s Alice, wonder where the rest of the cat is. Actually, “filling in” occurs at several different stages of the visual process, and it’s somewhat misleading to lump all of them together in one phrase. Even so, it’s clear that the mind, like nature, abhors a vacuum and will apparently supply whatever information is required to complete the scene. Migraine sufferers are well aware of this extraordinary phenomenon. When a blood vessel goes into a spasm, they temporarily lose a patch of visual cortex and this causes a corresponding blind region — a scotoma — in the visual field. (Recall there is a point-to-point map of the visual world in the visual field.) If a person having a migraine attack glances around the room and his scotoma happens to “fall” on a large clock or painting on the wall, the object will disappear completely. But instead of seeing an enormous void in its place, he sees a normal-looking wall with paint or wallpaper. The region corresponding to the missing object is simply covered with the same color of paint or wallpaper. What does it actually feel like to have a scotoma? With most brain disorders you have to remain content with a clinical description, but you can get a clear sense of what is going on in migraine sufferers by simply examining your own blind spot. The existence of this natural blind spot of the eye was actually predicted by the seventeenth-century French scientist Edme Mariotte. While dissecting a human eye, Mariotte noticed the optic disk — the area of the retina where the optic nerve exits the eyeball. He realized that unlike other parts of the retina, the optic disk is not sensitive to light. Applying his knowledge of optics and eye anatomy, he deduced that every eye should be blind in a small portion of its visual field. Figure 5.2 Blind spot demonstration. Shut your right eye and look at the black dot on the right with your left eye. From about one and a half feet away, move the book slowly toward you. At a critical distance the circular hatched disk on the left will fall entirely on your blind spot and disappear completely. If you move the book closer still, the disk will reappear. You may need to “hunt” for the blind spot by moving the book to and fro several times until the disk disappears. Notice that when the disk disappears you don’t see a dark void or hole in its place. The region is seen as being covered with the same light gray color as the background. This phenomenon is loosely referred to as “filling in”. But how sophisticated is this filling-in process? Are there clear limits as to what can be filled in and what cannot? And would answering this question give us hints about what type of neural brain machinery may be involved in allowing it to happen? First, you can decapitate your friends and enemies, using your natural blind spot. Standing about ten feet away from the person, close your right eye and look at his head with your left eye. Now, slowly start moving your left eye horizontally toward the right, away from the person’s head, until your blind spot falls directly on his head. At this critical distance, his head should disappear. When King Charles II, the “science king” who founded the Royal Society, heard about the blind spot, he took great delight in walking around in his court decapitating his ladies in waiting or beheading criminals with his blind spot before they were actually guillotined. I must confess I sometimes sit in faculty meetings and enjoy decapitating our departmental chairman. Next we can ask what will happen if you run a vertical black line through your blind spot. Again, close your right eye and stare at the black spot to the right of the picture (Figure 5.3) with your left eye. Then move the page gradually to and fro until the small hatched square on the center of the vertical line falls exactly inside your left eye’s blind spot. (The hatched square should now disappear.) Since no information about this central portion of the line — falling on the blind spot — is available to the eye or the brain, do you perceive two short vertical lines with a gap in the middle, or do you “fill in” and see one continuous line? The answer is clear. You will always see a continuous vertical line. Perhaps neurons in your visual system are making a statistical estimate; they “realize” that it is extremely unlikely that two different lines are precisely lined up on either side of the blind spot in this manner simply by chance. So they “signal” to higher brain centers that this is probably a single continuous line. Everything that the visual system does is based on such educated guesswork. But what if you try to confound the visual system by presenting internally contradictory evidence — for instance, by making the two line segments differ in some way? What if one line is black and the other is white (shown on a gray background)? Does your visual system still regard these two dissimilar segments as being parts of a single line and proceed to complete it? Surprisingly, the answer is again yes. 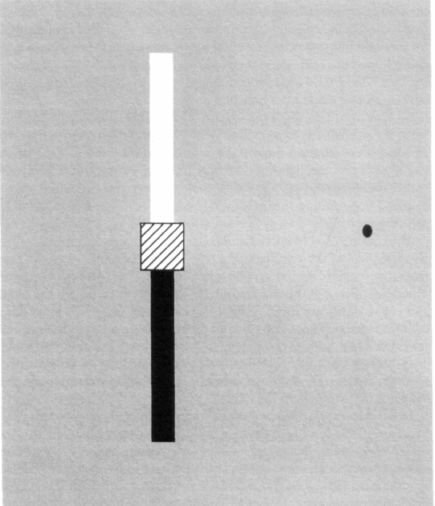 You will see a continuous single straight line, black on top and white below, but smeared in the middle into a lustrous metallic gray (Figure 5.4). This is the compromise solution that the visual system seems to prefer. 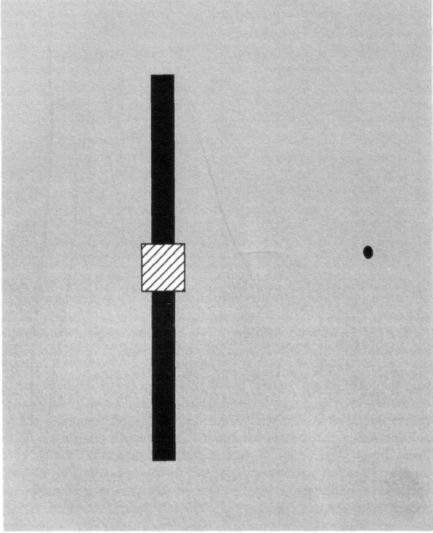 Figure 5.3 A vertical black line running through the blind spot. Repeat the procedure described for Figure 5.2. 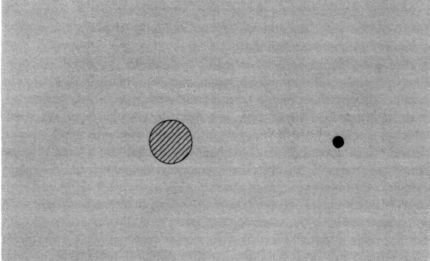 Shut your right eye, look at the small black dot on the right with your left eye and move the page to and fro until the hatched square on the left falls on your blind spot and disappears. Does the vertical line look continuous, or does it have a gap in the middle? There is a lot of variation from person to person, but most people “complete” the line. If the illusion doesn’t work for you, try aiming your blind spot at a single black-white edge (such as the edge of a black book on a white background) and you will see it complete. Figure 5.4 The upper half of the line is white and the lower half black. Does your brain complete the vertical line in spite of this internally contradictory evidence? Completing a corner is obviously too big a challenge for the visual system; perhaps it can cope only with very simple patterns such as homogeneous colors and straight lines. But you’re in for a surprise. 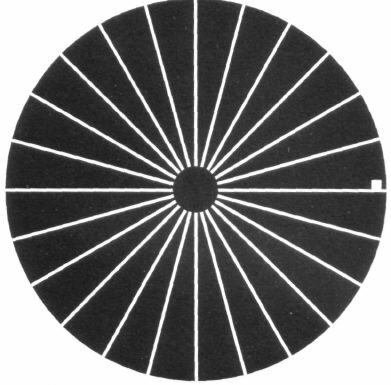 Try aiming your blind spot at the center of a bicycle wheel with radiating spokes (Figure 5.7). Notice that when you do this, unlike what you observed with the corner of the square, you do not see a gap or smudge. You do indeed “complete” the gap — you actually see the spokes converging into a vortex at the center of your blind spot. Figure 5.5 Repeat the experiment, “aiming” your blind spot at a pattern that resembles a swastikaan ancient Indo-European peace symbol. 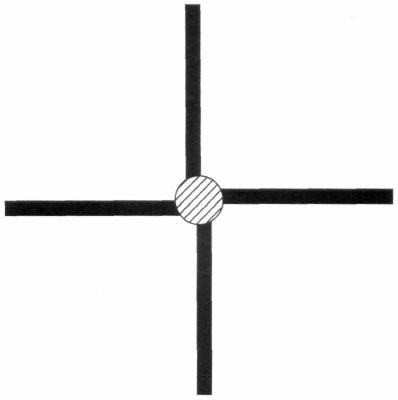 The lines are deliberately misaligned, one on either side of the blind spot. Many people find that when the central hatched disk disappears, the two vertical lines get “lined up” and become collinear, whereas the two horizontal lines are not lined upthere is a slight bend or kink in the middle. So it appears that there are some things you can complete across the blind spot and other things you cannot, and it’s relatively easy to discover these principles by simply experimenting with your own blind spot or a friend’s. Some years ago, Jonathan Piel, the former editor of Scientific American, invited me to write an article on the blind spot for that journal. Figure 5.6 Move the page toward you until the hatched disk falls on the blind spot. Does the corner of the square get completed? The answer is that most people see the corner “missing” or “smudged”; it does not get filled in. This simple demonstration shows that filling in is not based on guesswork; it is not a high-level cognitive process. Soon after the article appeared, I received hundreds of letters from readers who tried the various experiments I had described or had devised new ones of their own. These letters made me realize how intensely curious people are about the inner workings of their visual pathways. One chap even embarked on a whole new style of art and had a show of his own paintings at an art gallery. He had created various complex geometric designs, which you have to view with one eye, aiming your blind spot at a specific section of the painting. Like James Thurber, he had used his blind spot creatively to inspire his art. I hope these examples have given you a feel for what it is like to “fill in” missing portions of the visual field. Figure 5.7 Amazingly, when the blind spot is aimed at the center of a bicycle wheel, no gap is seen. People usually report that the spokes converge toward a vortex. Josh was a large man with Brezhnev-like eyebrows, a barrel chest and meaty hands. Yet he exuded a natural twinkle and sense of humor that infused what would otherwise be a rather menacing body type with the burly sweetness of a teddy bear. Whenever Josh laughed, everyone in the room chuckled with him. Now in his early thirties, some years earlier he had suffered an industrial accident in which a steel rod penetrated the back of his skull, punching a hole in his right occipital pole in the primary visual cortex. When Josh looks straight ahead, he has a blind spot about the size of my palm to the left of where he’s looking. No other part of his brain was damaged. When Josh came to see me, he said that he was well aware that he had a large blind spot. Josh insisted, however, that other than these occasional hints that something was wrong, his vision seemed surprisingly normal. In fact, given his deficit, he was surprised by the unitary nature of his visual world. Unless he scrutinized his visual field, Josh seemed to fill in the missing information with no trouble. Although researchers have known for a long time that patients like Josh exist (and live quite normally except when frightening women in ladies’ rooms), many psychologists and physicians have remained skeptical of the filling-in phenomenon. For example, the Canadian psychologist Justine Sergent claimed that patients like Josh are confabulating or engaging in a kind of unconscious guesswork when they say they can see normally. (He guesses that there is wallpaper in his scotoma because there is wallpaper everywhere else.) This type of guesswork, she said, would be very different from the types of true perceptual completion that you experienced when you had a line passing through your blind spot.10 But I realized that Josh gave us the opportunity to find out what is really going on inside a scotoma. Why try to second-guess the mechanisms of vision from scratch when we could ask Josh? Josh swept into the laboratory one drizzly, cold afternoon, propped an umbrella in one corner and lit up the room with his cheerfulness. He was dressed in a plaid shirt, loose jeans and beat-up running shoes, damp with mud from the walk into our building. We were going to have some fun today. Our strategy was simply to repeat on Josh all the experiments you just did on your own blind spot. First, we decided to see what would happen if we ran a line through his scotoma, where a big piece of the visual field was missing. Would he see the line as having a gap, or would he fill it in? But before we did the experiment, we realized we had a minor technical problem. If we gave Josh an actual line, asked him to look straight ahead and tell us whether he saw a complete line or piece missing, he might “cheat” inadvertently. He might accidentally move his eyes a tiny amount, and the slight motion would bring the line into his normal visual field and would tell him that the line is complete. We wanted to avoid that so we simply presented Josh with two half lines on either side of his scotoma and asked him what he saw. Would he see a continuous line or two half lines? Recall that when you tried this little experiment using your own blind spot, you saw the lines as complete. “Okay”, I said. This was not going anywhere. He held up his right index finger vertically, pointing upward, to mimic the bottom line and his left index finger pointing downward to mimic the top line. At first the two fingertips were two inches apart, and then Josh started moving them toward each other. “Okay”, he said excitedly. “They’re growing, growing, growing, growing together, and now there’s one complete line.” As he said this, his index fingers touched. Not only is Josh filling in, but the filling in is happening in real time. He could watch it and describe it, contrary to claims that the phenomenon doesn’t exist in people with scotomas. Clearly some nerve circuits in Josh’s brain were taking two half lines, lying on either side of the scotoma, as sufficient evidence that there is a complete line there, and these circuits are sending this message to higher centers in Josh’s brain. So his brain could complete information across the huge, gaping hole right near his center of gaze in much the same way that you did across your natural blind spot. “Hey, they started like this and now they’re moving toward each other like this.” He again held up his fingers to show the two lines moving sideways. “Now they’re completely lined up, and now they’re filling in like that. Okay, now it’s complete.” The whole process lasted five seconds, an eternity as far as the visual system is concerned. We repeated the experiment several times with identical results. So it seemed fairly clear we are dealing with genuine perceptual completion here, for why else would it take so many seconds? If Josh were guessing, he should guess immediately. But how far could we push this? How sophisticated is the visual system’s capacity to “insert” the missing information? What if we used a vertical column of “X’s” instead of a plain line? Would he actually hallucinate the missing “X’s”? What if we used a column of smiling faces? Would he fill in the scotoma with smiling faces? So we put the vertical column “X’s” on the computer screen and asked Josh to look to the immediate right of this column so that the middle three “X’s” fell on the scotoma”. I told him to keep looking at it since we had already established that filling in takes time. He stared at it for three minutes, four minutes, five minutes, and then we both gave up. Josh was filling in the little “x’s” but not the big “X’s”. This difference is important for two reasons. First it rules out the possibility of confabulation. Often in neurology tests, patients will make up a story, putting on a show for the physician’s benefit. Knowing there were “x’s” above and below, Josh could have guessed that he “saw” them in between without really doing so. But why would he only engage in such guesswork for the little “x’s” and not the big ones? Since he did not fill in the missing large “X’s”, we can assume that in the case of the little “x’s” we’re dealing with a genuine perceptual completion process, not with guesswork or confabulation. Why did the genuine perceptual completion occur only for the little “x’s” and not the large ones? Perhaps the brain treats the tiny “x’s” as forming a continuous texture and therefore completes it, but when confronted with large “x’s” it switches to a different mode of operation and “sees” that some of the “X’s” were missing. My hunch is that the tiny letters activated a different part of Josh’s visual pathway, one that deals with continuity of textures and surfaces, whereas the large letters would be processed in the pathway in his temporal lobes that is concerned with objects (discussed in the last chapter) rather than surfaces. It makes sense that the brain should be especially skilled at completing gaps when dealing with continuous surface textures and colors but not when dealing with objects. The reason is that surfaces in the real world are usually composed of uniform “stuff” or surface texture — like a block of grainy wood or a sandstone cliff — but there is no such thing as a natural surface made up of large alphabetical letters or faces. (Of course man-made surfaces like wallpaper can be made of smiling faces, but the brain didn’t originally evolve in a man-made world.) To test the notion that completion of textures and “stuff” across a gap can occur much more easily than completion of objects or letters, I was tempted to try something a bit outlandish. I put up the numerals 1, 2 and 3 above the scotoma and 7, 8 and 9 below. Would Josh perceptually complete the sequence? What would he see in the middle? Of course, I used tiny numerals to ensure that the brain would treat them as a “texture”. We had induced a curious form of temporary dyslexia in Josh. Those middle numbers did not exist, were not flashed before his eyes, yet his brain was making up the textural attributes of the number string and completing it. This is another striking demonstration of division of labor in the visual pathways. The system in his brain that deals with surfaces and edges is saying, “There is numberlike stuff in this region — that’s what you should see in the middle”, but since there are no actual numbers, his object pathway remains silent and the net result is illegible “hieroglyphics”! It has been known for over two decades now that what we call the visual system is actually several systems; that there are multiple specialized cortical areas concerned with different visual attributes such as motion, color and other dimensions. Does filling in occur separately in each of these areas, or does it occur all at once in just one single area? To find out, we asked Josh to look at the center of a blank screen on the computer monitor, and then we suddenly switched on a pattern of twinkling black dots on a red background. Josh whistled, apparently taking as much delight in all this as I was. “My God, doctor”, he said, “I can actually see my scotoma for the first time.” He yanked a felt pen from my hand and much to my dismay proceeded to start drawing on the monitor, producing what appeared to be an outline of the irregular margins of the scotoma (Josh’s ophthalmologist, Dr. Lilian Levinson, had earlier mapped out his scotoma using a sophisticated technique called perimetry and I could therefore compare his drawing with hers; they were identical). “But Josh, what do you see inside the scotoma?” I asked. The answer is that filling in seems to occur at different speeds for different perceptual attributes like color, motion (twinkle) and texture. Motion takes longer to fill in than color, and so on. Indeed, such differential filling in provides additional evidence that such specialized areas do exist in the human brain. For if perception were just one process happening in a single location in the brain, it should happen all at once, not in stages. Finally, we tested Josh’s ability to fill in more sophisticated shapes, like the corners of squares. Remember when you tried aiming your blind spot on a corner, it was chopped off — your brain apparently couldn’t fill it in. When we tried the same experiment on Josh, we got the opposite result. He had no difficulty in seeing the missing corner, proving that very sophisticated types of completion were taking place in his brain. By now, Josh was feeling tired, but we had succeeded in making him as intensely curious about the filling-in process as we were. Having heard the King Charles story from me, he decided to try to aim his scotoma at my graduate student’s head. Would his brain prefer to complete her head (contrary to what happened in your blind spot) to prevent such a horrendous spectacle? The answer is no. Josh always saw this person with a head missing. Thus he could fill in parts of simple geometric shapes but not complex objects like faces or things of that nature. This experiment again shows that filling in is not simply a matter of guesswork, for there is no reason Josh shouldn’t have been able to “guess” that my student’s head was still there. An important distinction must be made between perceptual and conceptual completion. To understand the difference, just think of the space behind your head now as you are sitting on your chair reading this book. You can let your mind wander, thinking about the kinds of objects that might be behind your head or body. Is there a window? A Martian? A gaggle of geese? With your imagination, you can “fill in” this missing space with just about anything, but since you can change your mind about the content, I call this process conceptual filling in. Perceptual filling in is very different. When you fill in your blind spot with a carpet design, you don’t have such choices about what fills that spot; you can’t change your mind about it. Perceptual filling in is carried out by visual neurons. Their decisions, once made, are irreversible: Once they signal to higher brain centers “Yes, this is a repetitive texture” or “yes, this is a straight line”, what you perceive is irrevocable. We will return to this distinction between perceptual and conceptual filling in, which philosophers are very interested in, later when we talk about consciousness and whether Martians see red in Chapter 12. For now, it suffices to emphasize that we’re dealing with true perceptual completion across the scotomas, not just guesswork or deduction. This phenomenon is far more important that one might imagine from the parlor games I’ve just described. Decapitating department chairmen is amusing, but why should the brain engage in perceptual completion? The answer lies in a Darwinian explanation of how the visual system evolved. One of the most important principles in vision is that it tries to get away with as little processing as it can to get the job done. To economize on visual processing, the brain takes advantage of statistical regularities in the world — such as the fact that contours are generally continuous or that table surfaces are uniform — and these regularities are captured and wired into the machinery of the visual pathways early in visual processing. When you look at your desk, for instance, it seems likely that the visual system extracts information about its edges and creates a mental representation that resembles a cartoon sketch of the table (again, this initial extraction of edges occurs because your brain is mainly interested in regions of change, of abrupt discontinuity, at the edge of desk, which is where the information is). The visual system might then apply surface interpolation to “fill in” the color and texture of the table, saying in effect, “Well, there’s this grainy stuff here; it must be the same grainy stuff all over.” This act of interpolation saves an enormous amount of computation; your brain can avoid the burden of scrutinizing every little section of the desk and can simply employ loose guesswork instead (bearing in mind the distinction between conceptual guesswork and perceptual guesswork). What has all of this got to do with James Thurber and other patients with Charles Bonnet syndrome? Might the findings that we have discussed so far about the brain’s capacity for “filling in” blind spots and scotomas also help us understand the extraordinary visual hallucinations they experience? Medical syndromes are named after their discoverers, not the patients who suffer from them, and this one was named after a Swiss naturalist, Charles Bonnet, who lived from 1720 to 1773. Even though he suffered from precarious health and was always on the brink of losing his own eyesight and hearing, Bonnet was a shrewd observer of the natural world. He was the first person to observe parthenogenesis — the production of offspring by an unfertilized female — and that led him to propose an absurd theory known as preformationism, the idea that each egg carried by a female must contain an entire preformed individual, presumably with miniature eggs of its own, each of which in turn contains even tinier individuals with eggs, and so on, ad infinitum. As luck would have it, many physicians remember Charles Bonnet as the gullible chap who hallucinated little people in eggs and not as the insightful biologist who discovered parthenogenesis. Fortunately, Bonnet was more perceptive when he observed and reported on an unusual medical situation in his own family. His maternal grandfather, Charles Lullin, had successfully undergone what in those days was dangerous and traumatic surgery — the removal of cataracts at age seventy-seven. Eleven years after the operation, the grandfather began suffering vivid hallucinations. People and objects would appear and disappear without warning, grow in size and then recede. When he stared at the tapestries in his apartment, he saw bizarre transformations involving people with strange gazes and animals that were, he realized, flowing from his brain and not the weaver’s loom. This phenomenon, as I mentioned earlier, is fairly common in elderly people with visual handicaps like macular degeneration, diabetic retinopathy, corneal damage and cataracts. A recent study in the Lancet, a British medical journal, reported that many older men and women with poor vision hide the fact that they “see things which aren’t really there”. Out of five hundred visually handicapped people, sixty admitted that they hallucinated, sometimes only once or twice a year, but others experienced visual fantasies at least twice a day. For the most part the content of their imaginary world is mundane, perhaps involving an unfamiliar person, a bottle or a hat, but the hallucinations can also be quite funny. One woman saw two miniature policemen guiding a midget villain to a tiny prison van. Others saw ghostly translucent figures floating in the hallway, dragons, people wearing flowers on their heads and even beautiful shining angels, little circus animals, clowns and elves. A surprising number of them report seeing children. Peter Halligan, John Marshall and I once saw a patient at Oxford who not only “saw” children in her left visual field but could actually hear their laughter, only to turn her head and realize no one was there. The images can be in black and white or color, stationary or in motion, and just as clear as, less clear than or more clear than reality. At times the objects blend into actual surroundings so that an imaginary person sits in a real chair, ready to speak. The images are rarely threatening — no slavering monsters or scenes of brutal carnage. Another woman said, “In my dreams I experience things which affect me, which are related to my life. These hallucinations, however, have nothing to do with me.” Others are not so sure. An elderly childless man was intrigued by recurrent hallucinations of a little girl and boy and wondered whether these hallucinations reflected his unfulfilled wish to become a father. There’s even a report of a woman who saw her recently deceased husband three times a week. Given how common this syndrome is, I am tempted to wonder whether the occasional reports of “true” sightings of ghosts, UFOs and angels by otherwise sane intelligent people may merely be examples of Charles Bonnet hallucinations. Is it any surprise that roughly one third of Americans claim to have seen angels? I’m not asserting that angels don’t exist (I have no idea whether they do or not) but simply that many of the sightings may be due to ocular pathology. Poor lighting and the changing tones at dusk favor such hallucinations. If the patients blink, nod their heads or turn on a light, the visions often cease. Nevertheless, they have no voluntary control over the apparitions, which usually appear without warning. Most of us can imagine the scenes these people describe — a miniature police van with miniature criminals running about — but we exert conscious control over such imaginations. With Charles Bonnet syndrome, on the other hand, the images appear completely unbidden as if they are real objects. This sudden appearance of intrusive images was apparent in the case of Larry MacDonald, a twenty-seven-year-old agronomist who suffered a terrible automobile accident. Larry’s head smashed into the windshield, fracturing the frontal bones above his eyes and the orbital plates that protected his optic nerves. Comatose for two weeks, he could neither walk nor talk when he regained consciousness. But that wasn’t the worst of his problems. As Larry recalls, “The world was filled with hallucinations, both visual and auditory. I couldn’t distinguish what was real from what was fake. Doctors and nurses standing next to my bed were surrounded by football players and Hawaiian dancers. Voices came at me from everywhere and I couldn’t tell who was talking.” Larry felt panic and confusion. Gradually, however, his condition improved as his brain struggled to repair itself after the trauma. He regained control over his bodily functions and learned to walk. He could talk, with difficulty, and learned to distinguish real voices from imagined ones — a feat that helped him suppress the auditory hallucinations. I met Larry five years after his accident because he had heard about my interest in visual hallucinations. He talked slowly, with effort, but was otherwise intelligent and perceptive. His life was normal except for one astonishing problem. His visual hallucinations, which used to occur anywhere and everywhere in his visual field with brilliant colors and spinning motions, had retreated into the lower half of his field of vision, where he was completely blind. That is, he would only see imaginary objects below a center line extending from his nose outward. Everything above the line was completely normal; he would always see what was really out there. Below the line, he had intermittent recurrent hallucinations. “Back in the hospital, colors used to be a lot more vivid”, Larry said. “As I look at you, there is a monkey sitting on your lap”, Larry announced. I was not sure. What does he mean by “more real than real”? There is a school of art called superrealism in which the paintings of things like Campbell’s soup cans are created with the kind of fine detail you only get through a magnifying glass. These objects are strange to look at, but maybe that was how Larry saw images in his scotoma. Not long after my conversations with Larry, I met another Charles Bonnet patient, whose world was stranger yet. She was plagued by cartoons! Nancy was a nurse from Colorado who had an arteriovenous malformation or AVM — basically a cluster of swollen and fused arteries and veins in the back of her brain. If it were to rupture, she could die from a brain hemorrhage, so her doctors zapped the AVM with a laser to reduce it in size and “seal it off”. In so doing they left scar tissue on parts of her visual cortex. Like Josh, she had a small scotoma and hers was immediately to the left of where she was looking, covering about ten degrees of space. So that’s what she meant when she said they were like comic books. “Are they familiar people or are they people you’ve never seen?” I asked. Here is a woman whose brain creates Walt Disney cartoons in defiance of copyright. What is going on? And how could any sane person see a monkey on my lap and accept it as normal? To understand these bizarre symptoms, we are going to have to revise our models of how the visual system and perception operate from day to day. In the not too distant past, physiologists drew diagrams of visual areas with arrows pointing up. An image would be processed at one level, sent on up to the next level and so on, until the “gestalt” eventually emerged in some mysterious manner. This is the so-called bottom-up view of vision, championed by artificial intelligence researchers over the last three decades, even though many anatomists have long emphasized that there are massive feedback pathways projecting from the so-called higher areas to lower visual areas. To pacify these anatomists, textbook diagrams usually also included arrows pointing backward, but, by and large, the notion of back projections was given more lip service than functional meaning. A newer view of perception — championed by Dr. Gerald Edelman of the Neurosciences Institute in La Jolla, California — suggests that the brain’s information flow resembles the images in a funhouse full of mirrors, continually reflected back and forth, and continually changed by the process of reflection.12 Like separate light beams in a funhouse, visual information can take many different paths, sometimes diverging, sometimes reinforcing itself, sometimes traveling in opposite directions. If this sounds confusing, let’s return to the distinction I made earlier between seeing a cat and imagining a cat. When we see a cat, its shape, color, texture and other visible attributes will impinge upon our retina and travel through the thalamus (a relay station in the middle of the brain) and up into the primary visual cortex for processing into two streams or pathways. As discussed in the previous chapter, one pathway goes to regions dealing with depth and motion — allowing you to grab or dodge objects and to move around the world — and the other to regions dealing with shape, color and object recognition (these are the how and what vision pathways). Eventually, all the information is combined to tell us that this is a cat — say, Felix — and to enable us to recall everything we’ve ever learned or felt about cats in general and Felix in particular. Or at least that’s what the textbooks tell us. Now think of what’s going on in your brain when you imagine a cat.13 There’s good evidence to suggest that we are actually running our visual machinery in reverse! Our memories of all cats and of this particular cat flow from top to bottom — from higher regions to the primary visual cortex — and the combined activities of all these areas lead to the perception of an imaginary cat by the mind’s eye. Indeed, the activity in the primary visual cortex may be almost as strong as if you really did see a cat, but in fact the cat is not there. This means that the primary visual cortex, far from being a mere sorting office for information coming in from the retina, is more like a war room where information is constantly being sent back from scouts, enacting all sorts of scenarios, and then information is sent back up again to those same higher areas where the scouts are working. It’s not yet clear exactly how this “interplay” occurs or what its function might be. But it may explain what is happening in the Charles Bonnet patients like Larry and Nancy or the senior citizens sitting in a darkened room at the nursing home. I suggest that they are filling in missing information in much the same way that Josh did except that they are using high-level stored memories.14 So, in Bonnet syndrome, the images are based on a sort of “conceptual completion” rather than perceptual completion; the images being “filled in” are coming from memory (top down) — not from the outside (bottom up). Clowns, water lilies, monkeys and cartoons populate the blind region rather than just the information immediately surrounding the scotoma such as lines and small “x’s”. Of course, when Larry sees a monkey in my lap he isn’t duped; he knows perfectly well it’s not real because he realizes it’s highly improbable that there should be a monkey in my office. Additional support for this interaction between top-down imagery and bottom-up sensory signals in perception comes from what we saw in phantom limb patients who have vivid impressions of clenching their nonexistent fingers and digging imaginary fingernails into their phantom palms, generating unbearable pain. Why do these patients actually feel clenching, “nails digging” and pain, whereas you or I can imagine the same finger position but feel nothing? The answer is that you and I have real input coming in from our hands telling us that there is no pain, even though we have memory traces in our brain linking the act of clenching with nails digging (especially if you don’t often cut your nails). But in an amputee, these fleeting associations and preexisting pain memories can now emerge without contradiction from ongoing sensory input. The same sort of thing might be happening in Charles Bonnet syndrome. But why did Nancy always see cartoons in her scotoma? One possibility is that in her brain the feedback comes mainly from the what pathway in the temporal lobe, which, you will recall, has cells specialized for color and shapes but not for motion and depth, which are handled by the how pathway. Therefore, her scotoma is filled with images that lack depth and motion, having only outlines and shapes, as do cartoons. If I’m right, all these bizarre visual hallucinations are simply an exaggerated version of the processes that occur in your brain and mine every time we let our imagination run free. Somewhere in the confused welter of interconnecting forward and backward pathways is the interface between vision and imagination We don’t have clear ideas yet about where this interface is or how it works (or even whether there is a single interface), but these patients provide some tantalizing clues about what might be going on. The evidence from them suggests that what we call perception is really the end result of a dynamic interplay between sensory signals and high-level stored information about visual images from the past. Each time any one of us encounters an object, the visual system begins a constant questioning process. Fragmentary evidence comes in and the higher centers say, “Hmmmmm, maybe this is an animal.” Our brains then pose a series of visual questions: as in a twenty-questions game. Is it a mammal? A cat? What kind of cat? Tame? Wild? Big? Small? Black or white or tabby? The higher visual centers then project partial “best fit” answers back to lower visual areas including the primary visual cortex. In this manner, the impoverished image is progressively worked on and refined (with bits “filled in”, when appropriate). I think that these massive feed forward and feedback projections are in the business of conducting successive iterations that enable us to home in on the closest approximation to the truth.16 To overstate the argument deliberately, perhaps we are hallucinating all the time and what we call perception is arrived at by simply determining which hallucination best conforms to the current sensory input. But if, as happens in Charles Bonnet syndrome, the brain does not receive confirming visual stimuli, it is free simply to make up its own reality. And, as James Thurber was well aware, there is apparently no limit to its creativity.